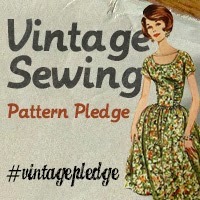 Here is project 3 for this month, once I had shrunk the pattern, it is actually a very quick make. To shrink the pattern I traced it off on to x and dot paper, I used to use the burda tracing paper but I find it just a bit too flimsy for this type of thing. I shortenend it by 3/4 inch first then cut it into five strips, each strip I overlapped 1/8 inch and stuck it back together, I had been using pritt stick, but I managed to pick up write on able scotch tape before christmas so I used that, it is quite a lot easier. The next thing I did was a SBA of 1/2 inch. I checked the measurements before laying it out and decided that I needed to put the two inches removed from the top back at the hip it’s a pity I didn’t realise this earlier as it would have meant I didn’t have to change the bottom half. The fabric is a beautiful purple with a white ‘flower’ design, I layed the pattern pieces out and drew on the extra 1/4 inch to the outside seam cutting out immediately, the last thing I wanted to do was forget what I had decided. 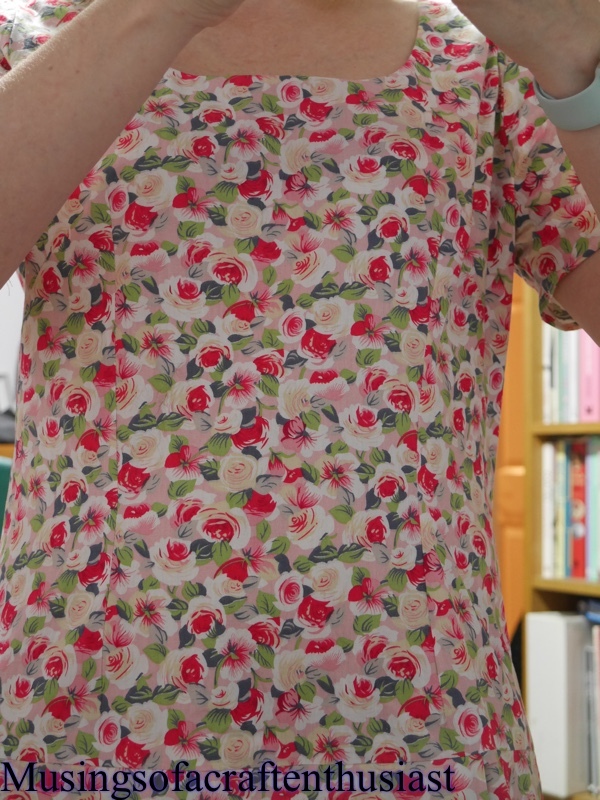 I actually put the dress together as per the instructions which meant hand stitching all the hems, the main problem with that is the ‘skirt’ pieces need to be hemmed before they are attached to the shorts. basically you put the top half together with the darts, facing and zip, for some reason at this point you don’t touch the sleeves, then you put the front shorts together and add the skirt overlay then repeat for the back, then finish making up the short and attach to the top half, once it is all cut out, even with the hand stitching it only takes about 3 hours to put together. hi, this should have been posted Sunday but had camera malfunction, i forgot to charge the spare battery oops. apart from adding the sleeves, I also added a couple of long fisheye darts to give the front a bit of shape, it totally changed the look of the dress from ‘meh sack’ to ‘ooh not quite sack’. Here are some pictures of me wearing it, another rare sight….. 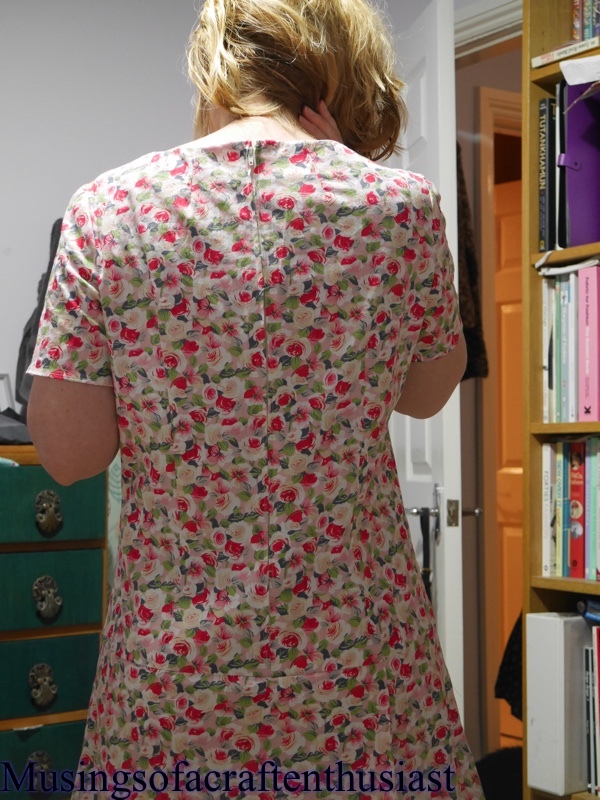 When I make it again, I think I will remove an inch from the back and front, I might have to add some of that back at the hips, but it is definitely too big across the top half. Looking at these pictures I might need to increase the back waist shaping as well, the arm sync also needs raising, I run the risk of cutting myself in half with the shorts every time I lift my arms.